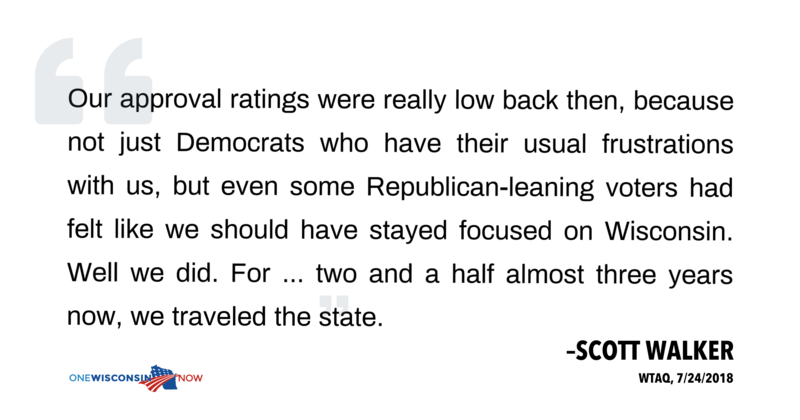 MADISON, Wis. — After his disastrous run for president, Gov. Scott Walker admitted in an interview that he needed to rehabilitate his political image in Wisconsin to have a chance at continuing his 25 year political career. One Wisconsin Now’s investigation of state records reveals Walker’s use and abuse of taxpayer resources, deploying the state airplane for over 869 flights at a cost in excess of $800,000, as he mounted his over two year long campaign to try to repair and rehabilitate his political image. 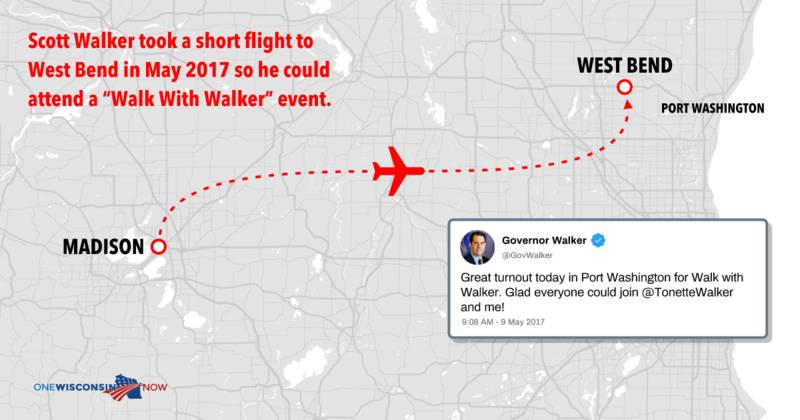 The flight data was compiled by One Wisconsin Now and covers the period from the end of Walker’s presidential bid in September 2015 through April 2018. The information is also available to the public at onewi.org/ScottWalkerAIR. Used state plane, on average, every 3 days for these 951 days. “Beyond the unprecedented expenditures of taxpayer dollars on flights for Gov. Walker is how he has used the plane, not out of necessity but out of convenience. It is the very definition of a career politician who has lost touch and believes he is owed special treatment on our dime,” said One Wisconsin Now Research Director Joanna Beilman-Dulin. 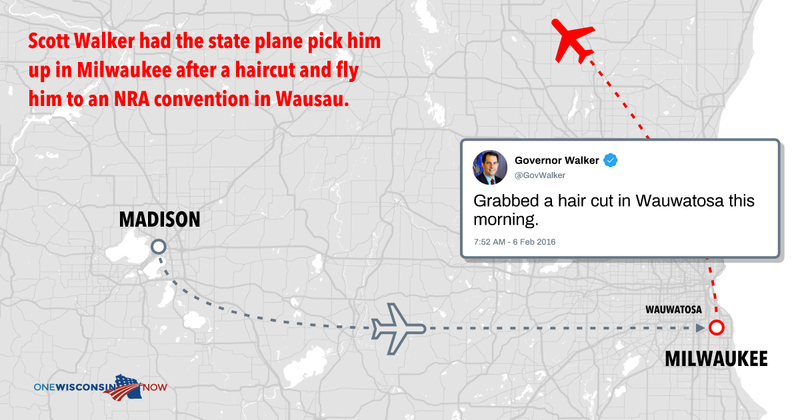 Cross referencing flight information with schedules, social media posts and other resources revealed that Walker has also used the plane for questionable purposes beyond his politicking.For example, flight records show in February 2016, Walker had a state plane sent from Madison to pick him up in Milwaukee after getting a haircut and attending a personal event to fly him to a National Rifle Association conference. The cost to taxpayers was $2,586. 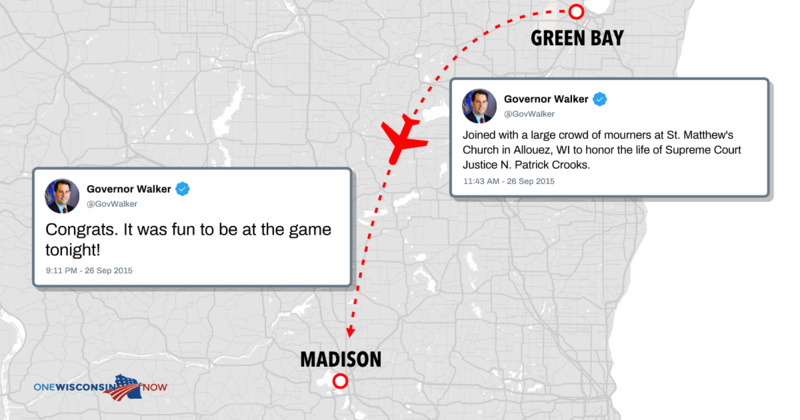 In September 2015 Walker used a state plane on a Saturday to fly to the funeral of Supreme Court Justice Patrick Crooks. Why would Walker spend $1,755 of taxpayer money on air travel when he could have driven? According to his social media posts he had tickets to a Badger football game that evening in Madison. Research Associates Savion Castro and Louise Lyall further broke down Walker’s state plane usage, detailing how he frequented state media markets and flew ridiculously short distances like the 24 miles from Appleton to Green Bay, 39 miles from Janesville to Madison or 24 miles from Kenosha to Milwaukee.